This was a graphic novel I had been waiting months to get my hands on and I knew when it would come out, I was going to make time in my life and go grab a copy. However, the release day comes and goes and so do some months and here I am finally picking up a copy and diving into a story that I didn't realize how much I missed it until I was at the end. We continue with the story from where it left off. Emily is trapped in the Void, Navin is flying to preparing for battle, and to survive the two must find each other in hopes of surviving. Can the two reconnect with each other in hopes of serving the upcoming Shadows while protecting the not only Alledia's survival but the survival of the people they love? How could one not fall in love with a story like this? Kibuishi just knows how to write entertaining literature. Plus his illustrations add to the brilliance of what this story is. Up to this point, we have been adventure, we have been given action, we have even been given heartbreak. 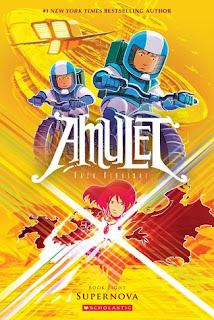 There are authors who possess the ability to write a story where readers of all ages are able to connect to the story, to the characters, and to the magic that some books bring and Kibuishi is on point. I loved how we got to spend some more people throughout the story. Yes we still did get our fair share of Emily and Navin but we got to see Prince Trellis, Morrie and so much more. We get to see troops of the opposing forces and as they surrender one must wonder if there is something much more going on than what we think? I did find myself reading this one a little slower, only for the reason that I am not wanting this series to end. However, there was a lot of filler in my opinion but that did not mean there was no lack of enjoyment while reading this. The author does a really great job in giving the reader enough details not only through the text but through his use of illustrations that are in the novel. So I do not know if this the second to last volume in this graphic novel series or not but if it is, I am really sad to see it end. However, I have already put my radar on for the next volume's release. if you have not read this graphic novel, you need to. If you were with the right people and read this graphic novel when it came out, I would love to know your thoughts. I give this graphic novel 5 souls!